Ok, here's a question I get a lot. Let me set the scenario for you. You have a tournament in 2 weeks on a lake you have never been to and don't really know anything about it. Where do you start? And more importantly how do you catch bass? First, before I leave, I do a ton of research on the lake itself. Size, depth, maps, predominant forage, and species available. I also search for current fishing reports and water conditions. When I find some reports, I am more looking for a starting point as far as lures, lure color and locations. I prefer to fish my way as opposed to what a magazine or dock talk tells me. However, sometimes some of the things you hear or read can be invaluable, especially hot colors or baits (this has helped me in Florida a few times). I take all of this information, and based upon the time of year, I dissect my map and make my decisions on where I am going to fish, and more importantly where I'm NOT going to fish. For example; If it's spawning time, then I'm going to avoid deeper main lake areas, generally on the lower end of the lake near the dam. 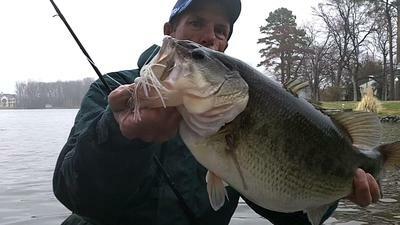 But, lets just say for sake of this post it's a largemouth bass fishery in the middle of June and the spawn is over and bass are in a solid early summer pattern. One of the biggest keys for me in unlocking a new body of water in a SHORT period of time is making the lake and the fish adapt to what I do well. I am a shallow dirty water angler, so naturally I would like to find the most stained water I can find. Another reason I like fishing this kind of water on a unfamiliar lake is because bass under those water conditions are generally easier to catch. This is important since I have a limited amount of time to figure out where the bass are, what they are doing, and how to catch them. The stained water allows me to be more successful with reaction baits like spinnerbaits, crankbaits, etc., which in turn allows me to cover water quickly hitting more areas on the lake... remember, we're under a time crunch. So I want stained water. Where should I look? On your map look for major creek or river arms feeding the lake. Traditionally, these will be on the upper half of the lake opposite the dam. Another advantage to targeting bass in these areas is that most times you will have current, which again, is to my advantage. So now, not only are the bass in this area going to be shallow and vulnerable to reaction baits due to the stained water, but now they are going to be predictably positioned on visible cover most likely on the bank because of the current. Now you go to these areas and look. Which one has the best water color, best cover, and seems most reliable if a front or major weather change occurs. Is the water stained due to recent weather that in a few days could change and push bass out? Or is it always stained due to the river feeding it? Is there deep water near by? Or easy access to a defined creek or river channel which can replenish your area with new waves of fish coming in. Is there current present? Stay in constant view of your electronics, paying special attention to water temperature readings, bottom composition, and most of all, schools of bait fish. Also observe the water and shore for birds and bait. Herons, loons, seagulls and osprey have all helped me to slow down and pay more attention to an area that I normally would pass. Bait is often the key on big bodies of water. Find not only the bait, but the right bait, and you find bass. Now I've picked my spot (or spots) and its time to fish. find concentrations of bass quickly and take note of what kind of cover they hit on, what was the depth, if there was any current. After hitting as many spots as I can in a day, I regroup and review what I've learned. Ok, I caught x number of bass and out of those, x number where in x feet of water on x type of cover. Ok, I caught 2 bass in this creek, and 4 in this one, but 7 in this one. Then out of those 7 bass, 4 of them came on a 200 yard stretch of bank. Bingo! There's your sweet spot. Now I return the next day and saturate the area with the same baits along with others, such as jigs, plastics, etc. I also spend even more time examining the bottom with my electronics looking for more cover and depth change that wasn't noticeable when I zipped through the area with my trolling motor on high the day before. Now I'm totally trying to milk this area and find what it has to offer. And decide if it's worthy of being an all day area. And does it have the replenishing factor based upon its location in the creek, deeper water proximity, abundance of cover and bait. Now is when instinct becomes a factor. You already have found bass. Goal #1 accomplished. But now we are gonna get greedy and try to win. Do you believe this is an all day spot? Or is it just a key piece that has helped you unlock a pattern you can run all day in your tournament by looking for similar areas on your map or in the similar areas you already have caught bass on while prefishing? All I can tell you is go with your gut. You have to trust YOUR instincts if your going to be successful. If you don't think your good enough, then you wouldn't even be competing in this event anyway. I can give you some advice. For me, size of the bass plays a major role in deciding if it's an all day spot, but not so much the numbers of bass. Meaning, if I caught 8 two pound bass in this spot as opposed to 3 two pounders in another spot. Then I'm gonna lean towards running the pattern all over the lake as in hopes of running into some bigger fish. But say I caught 2 four pounders mixed in with those, and every other bass I caught on the lake was 2 or under. I may lean towards hole sitting. It's all instinct. Unless the spot is so hot it makes the decision for you. But those don't happen often. Now you make your decision and you live with it. You won't always win and you won't always be right. But you will learn from it and become even more adept at fishing to your strengths and breaking down a new body of water. When you do succeed and cash a check or win, your confidence sky rockets. Confidence is everything in this game. When you don't, look at what you did wrong and right and apply it the next time you go to another new lake. This is how I do it. But these are my strengths. Yours might be different, but the same principles apply. First research and find areas on the map that fit your style of fishing. Eliminate those that don't. Base your decision on the seasonal patterns and movements of the predominant species available, and the type of depth, cover, and water clarity that you are good at. Then go there and use your electronics, eyes, instincts and search baits to locate bass and the cover they're using. Then go back to your most productive areas. Milk them and decide if you've found a honey hole or a pattern. Use your instincts. Fish accordingly. And learn about the good or bad things from your decisions. This is how I find bass QUICKLY. When I have a lot of time or I'm just fun fishing, I may use a different approach. But, when you have 2 to 5 days tops to locate and catch a limit of bass, if you follow these basic principles you will be successful more often than failing. Hope this helps. Tight Lines. Thanks for sharing your bass fishing tips, Steve. 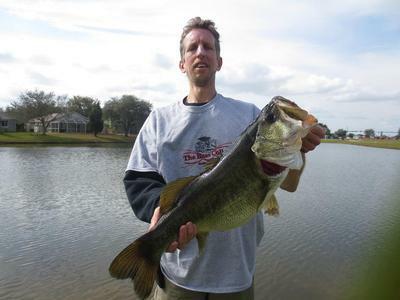 Your article has a lot of great info with a thorough breakdown of figuring out how to find and catch bass in a new lake. I enjoyed the read, and it should help out many other bass anglers get after it on the water. Been fishing 60 years. This article simply nails down the fundamentals that all lake fishermen should use. I learned the hard way by fishing every inch of shoreline on a mid-sized lake. I found that rocky points off of the main or feeder creek channels held bass. Rocks had to be present to contain bass. I too started watching birds fish from the bank. I now fish that lake with 3 colors of Texas rigged worms, a white spinner bait, or a shad colored rattle trap. Don't need anything else.